Norway had the highest price tags on new passenger cars sold in 2017. Like four years previous, Norwegians had to dig deeper into their pockets than any of their European neighbors, with prices roughly 20,000 euros higher than the EU-28 average. Reasons for automobiles being so costly in Norway are partly due to higher tax rates than in most other European countries. A VAT of 25 percent is imposed on all new and used passenger vehicles imported into the country, while registration tax on cars considers weight, CO2 and NOx emissions of the car. These incentives contribute to making larger, heavier vehicles using petrol and diesel engines more expensive than anywhere else in Europe. The only vehicles exempt from VAT and tolls were electric cars. 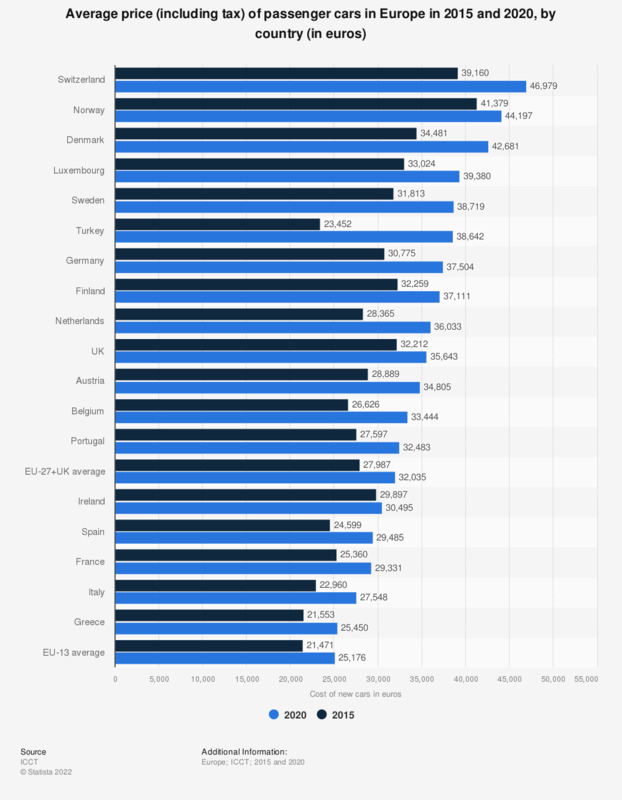 Other European countries with a 25 percent tax rate on acquisition are Croatia, Denmark and Sweden, while those in Hungary even exceeded Norwegian rates by two percent. As seen in this statistic higher tax rates on passenger cars translates to higher prices overall. Sweden and Denmark both appeared in the top seven most expensive car buying countries. Hence, in terms of volume of new car registrations, Northern European countries trailed behind not only their more populous neighbors, but also other smaller countries where tax rates were lower. Prices for passenger cars were forecast to stay relatively stable in the next three years, with only slight increases expected. Luxury cars were the only group where price change was estimated to be more prominent.